If you’re thinking of going digital, there’s never been a better time to think Positive. Effects aren’t part of the standard software (bar reverb). The brilliantly designed app works on iOS and Windows platforms, allowing users to build their own virtual amp from scratch as well as tapping into the thousands of ready-made patches on Positive Grid’s ToneCloud app. Bias Amp has proved so popular that some guitarists were plugging into audio interfaces and using it live. So, it was a natural step for Positive Grid to introduce its own in the shape of the Bias Head, which promises practically zero-latency operation, as well as the option of a whopping 600-watt power stage. 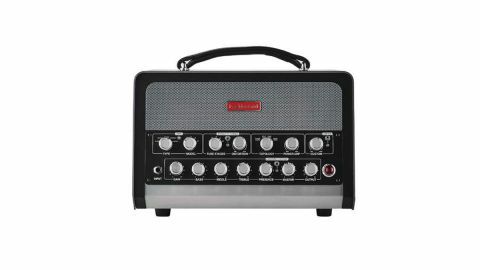 It is exquisitely designed and assembled; the internals are PCB-based and unsurprisingly look more like a computer than a guitar amp. The toaster-sized Bias Head’s front panel controls include reassuringly familiar knobs for gain, bass, mid, treble, presence and master volume, while over the top of these is a second row that allows instant tweaking of amp type, number of virtual tube stages, power amp topology and more. Around the back there are balanced and unbalanced stereo outputs, a headphones jack, MIDI in/out/thru sockets, footswitch sockets, two expression pedal jacks and a send/return for the programmable effects loop, USB socket and a wireless button that allows the Bias Head to communicate with the Bias Amp mobile app via Bluetooth. Tucked away in the bottom corner are useful toggle switches that let you run the amp’s speaker and line-outs in serial or parallel mode, for wet/dry rigs, and footswitch calibration. As the head has a purpose-built interface for the Bias Amp software, you’d expect integration to be faultless, and for the most part it is. Online activation and registration is fairly straightforward, with both amps hooking up to an iPad without any problems. PC owners may need some updates; Bias Amp worked fine with a modern Windows 10 laptop, but failed to run on an older Windows 7 machine, so check out forum posts on compatibility. The Bias Head allows real-time tweaking from the front panel controls like any regular guitar amp, and you can play with more esoteric features, such as power amp topology, or the number of preamp valve stages. The Bias Head comes with 25 presets out of the box arranged in five banks according to type. Turning the preset knob selects the patch, while tapping it swaps from Red to Green and back again. The overall quality of the presets on the head is excellent; your idea of what constitutes a perfect AC30 or tweed Bassman may not always line up with other people’s, but there’s plenty of flexibility in the software to deal with that. What’s more important is that the core tones are very usable for both live and recording situations, with plenty of instant-gratification patches in the ToneCloud for those occasions when time is in short supply. The coolest part, though, is the way it quickly interfaces with desks to provide that same quality direct to a house PA or a recording track. While effects have to be added separately, the built-in reverbs provide all the ambience you need for exceptional realism; the rooms, halls and plates are all very adaptable, while the chamber emulation is one of the best we’ve heard and essential for recreating the vibe of early guitar sounds from both sides of the Atlantic. The head has volume to spare for any size gig. Whatever your opinion of digital modelling, products such as the Bias Head definitely have their place, now and in the future, making it easy to get consistently great sounds on stage and in the studio, while bypassing the tedium of tweaking EQs and mic positioning. The playing experience comes very close to the real thing, convincingly replicating the response and dynamics of a real valve circuit. It’s not cheap, but you’re not just buying the hardware; the price also includes the wonderful Bias Amp software and entry to Positive Grid’s feature-rich ToneCloud portal.